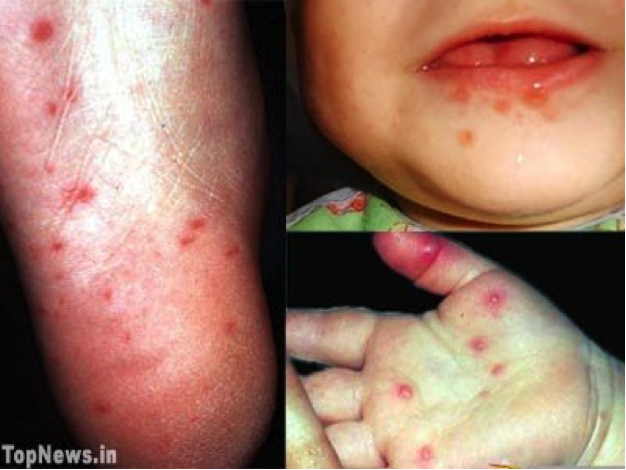 What is the course of hand foot and mouth disease? The incubation period (from exposure to symptoms) is generally 5 days. The illness is generally mild and self-limited and is usually resolves within a week. Complications such as viral meningitis and encephalitis and paralytic disease are very rare. How is hand foot and mouth disease diagnosed? Usually, the diagnosis of HFM is made on a combination of clinical history and characteristic physical findings. Laboratory confirmation is rarely necessary unless severe complications develop. Therapy for HFM is directed toward symptomatic relief of fever and sore throat and prevention of dehydration. Antibiotics are not indicated for this viral disease.